The Nelson and Norfolk exhibition is currently the focus of much of the department’s time. Primarily the ensign (tri colour flag) from Le Generaux which will be going on display for the first time in over 100 years. 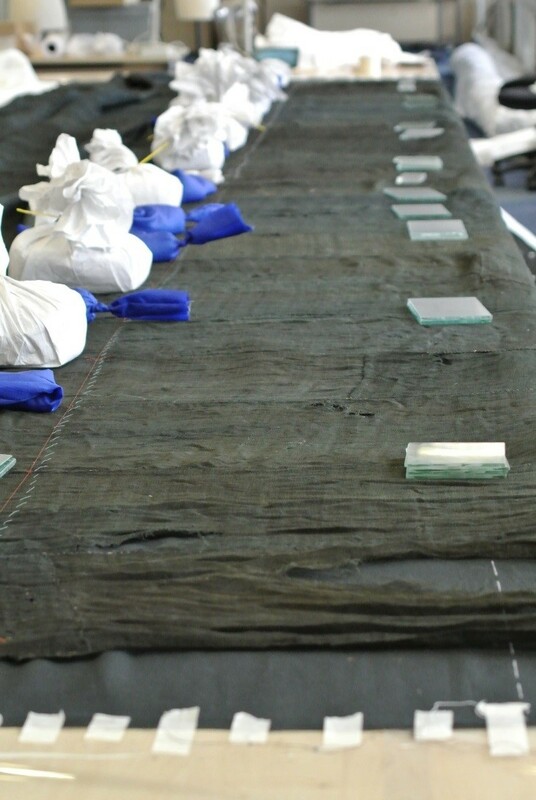 The logistics of conserving this enormous textile, which is 16mtrs by 8.3mtrs have been taxing us, but we have a work space where we can lay out the blue section and progress is steady but forwards. Due to time constraints we had to prioritize which areas of the flag were in most need of conservation. 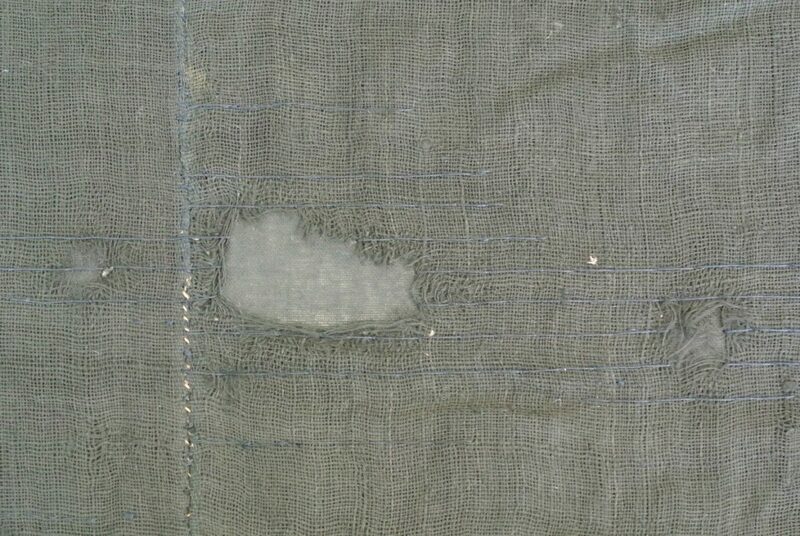 This was determined to be the blue section of the flag, due to the complete deterioration of the lining fabric which in turn was affecting the flag itself, and also the number of holes and weak areas, broken seams and all the usual problems associated with a textile that is over 200 years old. The first image shows the flag laid out with the new lining fabric laid out under tension on the table, the flag is laid on top and the two layers are held in place with weights prior to pinning and stitching. 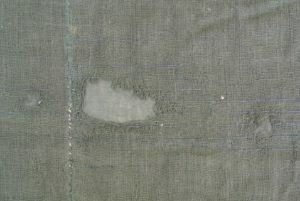 The second image shows a typical area of damage, the new stitching can be seen running in horizontal lines, and the new lining fabric can be seen through the damage. The lining fabric, 60 metres in total, has been dyed specifically for the flag and the polyester thread have been colour matched under the gallery lighting. The woollen fabric of the flag is not one uniform colour across the section, so a general dark blue with a hint of green was chosen and the thread is a dark navy. Under the gallery lighting they all come together as a unified treatment. The ensign is not the only textile we are displaying in the exhibition, we have items of uniform from the Greenwich Volunteers who were on duty while Nelson’s body laid in state in 1805. 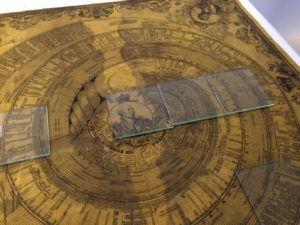 We also have a large printed handkerchief which commemorates the reign of King George III and the main events between 1760 – 1812, and includes a portrait of Nelson. In the past the handkerchief was stored folded and unfortunately it got wet, we know this from the pattern of the staining and the ‘cloud’ shape edges of the discolouration. This all forms part of its history and we do not now, routinely wet clean textiles because of this subsequent loss of information. More creases have been introduced since it joined our collections in 1943 due to being stored in a space that was far too small for it. This particular issue we have addressed, and the printed hankies are now stored flat or rolled rather than folded. The exhibition opens on Saturday July 29th in the Castle Museum and runs until Sunday 1st October.